February is in the books and we can officially close out our second below average month on temperatures in the last four. 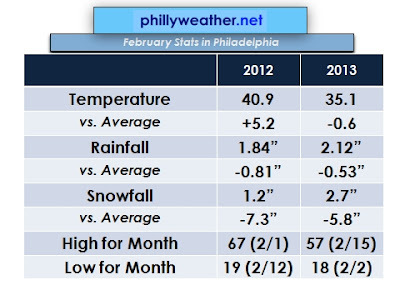 Temperatures finished 0.6 degrees below average, which is a stark contrast to 2012 when temperatures were over five degrees above normal in Philadelphia. This is also the first below average February since 2010 and the first since 2010, as we outlined yesterday, without a day where the temperature hit 60 during the month. The best we could do was 57. 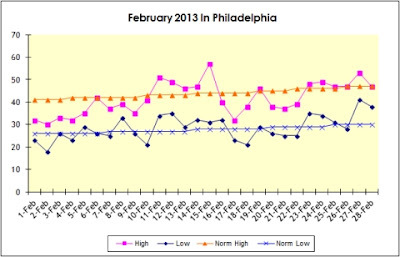 While it was crisp out for much of the month, the pattern wasn't snow conducive overall -- or in the times it was, the snow that did fall was in small quantities. We picked up 2.7" of snow for the month, more than last year but in a February where temperatures end up below average it's the lowest total we've seen since 1988. Snowlovers can't win them all, I guess.